From left to right: Ula Jurecka, Hallie Seline, Heath V. Salazar, Amaka Umeh, Aisha Evelyna, Ruth Goodwin and Annelise Hawrylak in The Wolves. The Wolves, currently getting its Toronto premiere from the Howland Company and Crow’s Theatre, has arrived in town with the equivalent of a heavy equipment bag full of hype on its back. 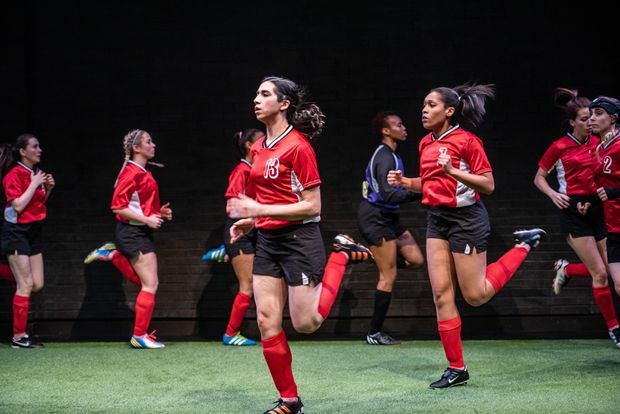 A finalist for the Pulitzer Prize in 2017, one of the most produced plays this season across North America, Sarah DeLappe’s debut play about teenage girls on a soccer team has already been named one of the best 25 American plays since Angels in America by the New York Times. Even though The Wolves may no longer be a dramatic underdog, however, you’ll quickly start rooting for the show and its unique and appealing contrast of carefully calibrated visuals and cacophonous sound. In a series of scenes, these nine numbered, but unnamed soccer players go about their pre-game stretches and warm-ups with precision. At the same time, the teens talk and talk, to and over another one another, about genocide in Cambodia, the synchronization of periods and their desire to land sports scholarships to college – or they side-step sensitive subjects such as eating disorders, abortion pills and sexual assault. DeLappe is in love with the ways American teenage girls speak, the direct passes and the fancy grapevine moves, and has found a way to stylize it for the stage convincingly, alternating between toying with stereotypes and subverting them. To give you an idea of her project, the first line of the play is “But it’s like / he’s old” – but, moments later, you realize the girls are talking about a war criminal being sent to die in jail. The talented ensemble in director Courtney Ch’ng Lancaster’s production finds different ways to rise to the play’s unusual physical and verbal challenges. Annelise Hawrylak and Amaka Umeh are two other young performers whose jersey numbers I jotted down with all the excitement of a scout stumbling upon future stars; they seem to live and breathe #2 and #00, respectively. A couple of big plot points that suddenly appear down the final stretch feel a little like the dramatic equivalent of a penalty shootout following a 0-0 game. But Robyn Stevan, a founding member of Soulpepper who recently returned from a 10-year hiatus from acting, is brilliant in her climactic appearance as a soccer mom – bringing an adult female voice onstage like a vision of the future where bodies and souls regenerate at a slower pace, to deliver a monologue that slices through you like a sabre. There’s only one place where DeLappe overshoots the goal. In the way American plays must to be considered serious, The Wolves gestures at being more than a play about a soccer team, that it might be A Play about America itself – in this case, when the team spontaneously begins singing the Schoolhouse Rock! song about the preamble to the American Constitution. In the preface to the published play, DeLappe writes grandly of “AstroTurf and American Exceptionalism” – but it seems an overly ambitious link to make on the stage, or in a neighbouring country to the north where we also play soccer indoors in Air Domes in the winter, anyway. Nevertheless, The Wolves are worth cheering on, and loudly – as is the fantastic new voice in American playwriting behind it.